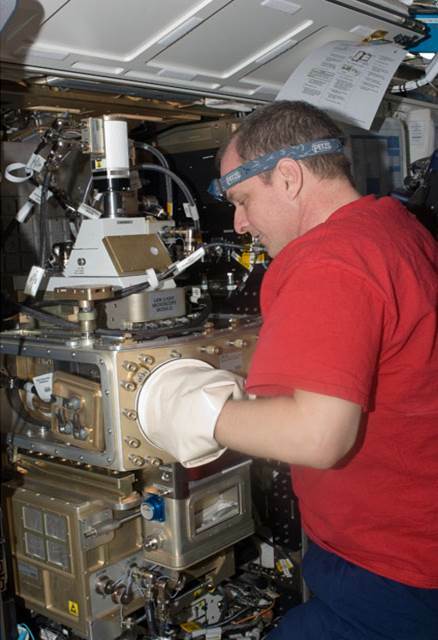 In today’s A Lab Aloft, Mike Hicks, project scientist at NASA’s Glenn Research Center in Cleveland, blogs about discovering the “cool” world of combustion aboard the International Space Station. 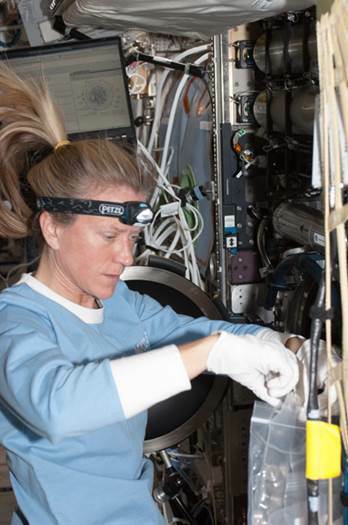 In a recent posting on this blog one of our International Space Station combustion researchers, Sandra Olson, noted that when it comes to combustion experiments in microgravity one should expect surprises. This has certainly proven to be true with one of our liquid fuel combustion investigations currently operating aboard the space station. The Flammability and Extinction (FLEX) study burns liquid fuels dispensed in the form of small, single droplets. The goal is to answer two key questions: the first is how difficult it is to keep a flame burning in microgravity? We call this flammability mapping. The second is how effective is gaseous carbon dioxide (CO2) (or other diluents) in extinguishing spacecraft fires? Gaseous CO2 is particularly important because this is the current fire suppressant used in the U.S. module of the space station. To answer these and other “burning questions” the FLEX team of scientists studies small droplets of fuel. 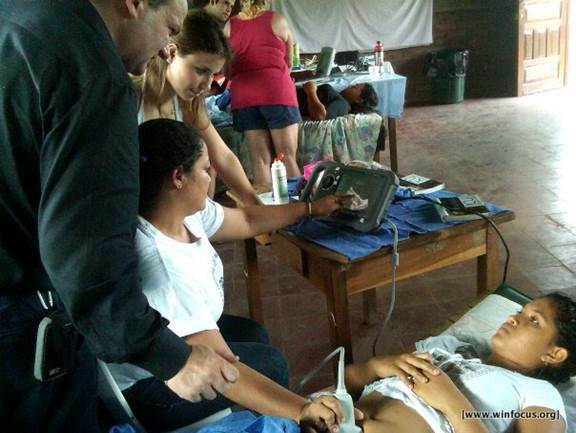 This approach allows a large number of tests to take place under a wide range of conditions. 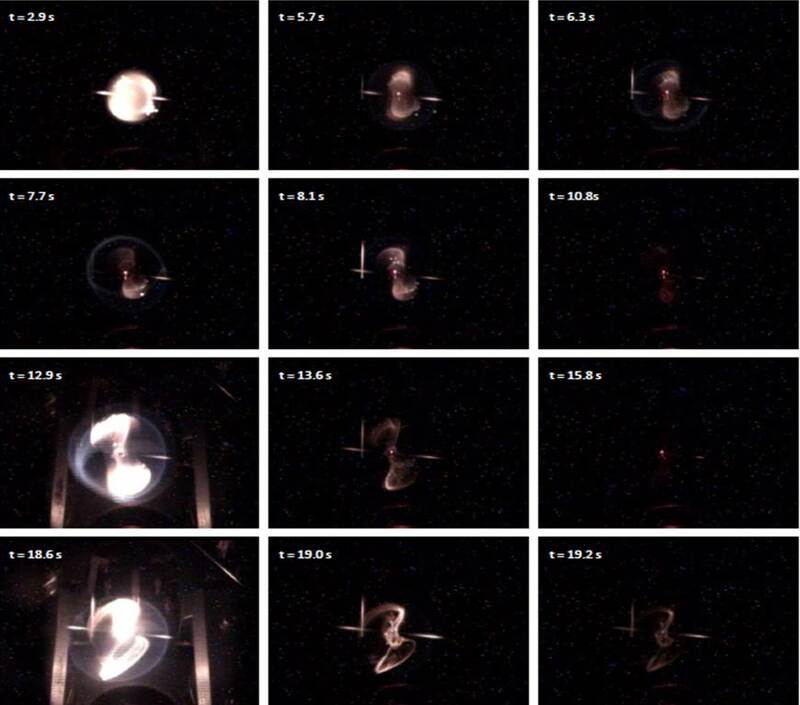 The flame that results from igniting these fuel droplets (ranging in size from 1.0 mm to 6.0 mm in diameter) achieves a shape that can only happen in a reduced gravity environment—that is, they become little glowing balls of fire. 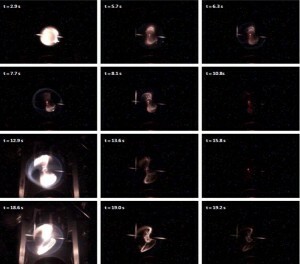 Within fractions of a second following ignition, the reaction front—visualized as a flame—quickly wraps around the fuel droplet and assumes a spherical shape. This remains mostly motionless until the droplet of fuel is consumed or until the conditions are such that the flame can no longer exist. You can watch the Strange Flames on the International Space Station video to see these microgravity flames in action. The overarching goal of FLEX is to better understand the complicated physical processes behind determining whether or not a flame can exist in a given environment for a given fuel type. The environment varies based on the amount of oxygen in the combustion chamber along with other gases that balance out the test atmosphere. Since combustion processes are rich in physics and chemistry, there are many parameters that play a role in flame survival. The FLEX experiments allow scientists a way to study these competing physical processes—such as the rate of fuel consumption, fuel characteristics, the controlling energy and mass transfer processes, and the physical properties of the gases that make up the test environment. By understanding and modeling these processes, we hope to better predict fire behavior in space. 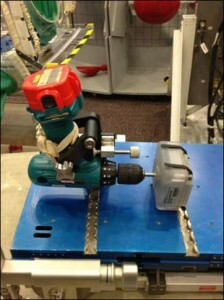 This also leads to Earth technology advances, such as more fuel efficient engine designs. 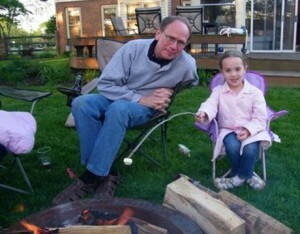 FLEX recently led us to a “cool” discovery, igniting the imaginations of many combustion researchers. During one of their many late night test sessions, the FLEX operations team noticed a very peculiar orange afterglow about 20 seconds after the flame had extinguished. It was so intense that the team first thought something else other than the fuel droplet was burning. After a few repeated tests, the team concluded that this bright afterglow resulted from tiny droplets of re-condensed fuel vapor. 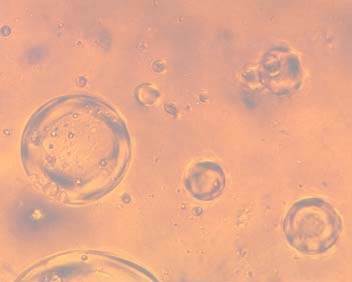 The idea was that these tiny droplets formed a fog, scattering the yellow-orange backlight that is used to project the droplet’s shadow onto one of the diagnostic cameras. The afterglow was initially dismissed as an artifact of the test configuration—or so we thought. A few days later we recovered the data from the space station and processed the images for accurate measurements. As we looked closely at the droplet shadow images we realized this glow was actually a clue to something new. Typically when a flame extinguishes, the evaporation of the fuel droplet will nearly stop, and the droplet stops shrinking, which makes entirely good sense—no flame, well then, no fuel consumption. We discovered with FLEX that under certain conditions when the flame disappeared, the droplet of fuel continued to evaporate at almost the same rate as when the flame was visible. In many cases this “apparent” fuel consumption without a flame lasted longer than with the flame. Even more startling, we saw that when the pressure of the chamber was slightly increased, the flame momentarily reappeared in a brief flash before quickly going out again. In some cases this phenomena repeated until the fuel was consumed. This finding has a number of interesting ramifications, both from a purely scientific perspective as well as from a fire safety perspective. 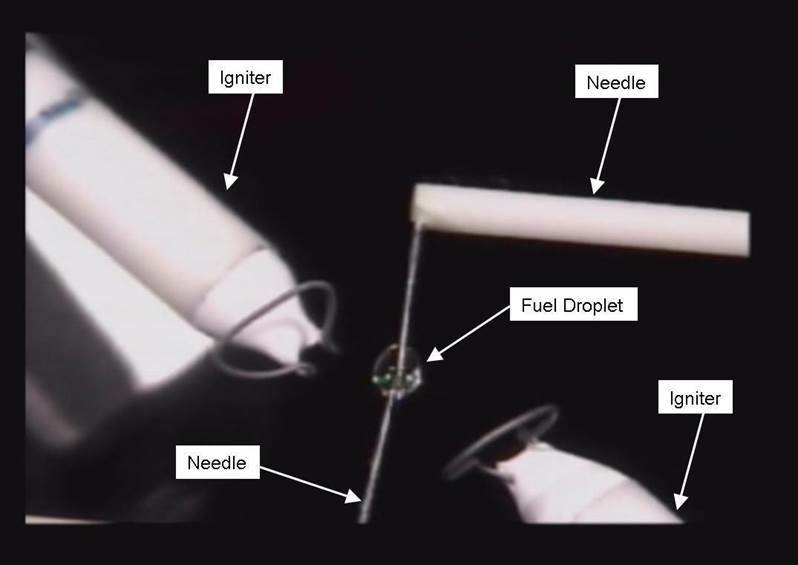 It provides the first direct observation of a long held concern—the possibility that microgravity conditions were conducive to re-ignition of flammable mixtures. At first glance, it seemed irrational that the fuel droplet continued to evaporate with no visible flame. Some of the science team argued, myself included, that this could be explained by characteristics of the test chamber environment. It was suggested that once the visible flame extinguished, that there was still a sufficient amount of energy remaining in the surrounding gases to continue the rate of the droplet’s evaporation. Since buoyant forces are absent in microgravity flames, the hot gases simply remain stationary around the droplet—so we theorized that as these gases cooled, heat transferred back into the droplet. We quickly realized, however, that this would have resulted in a gradual slowing of the droplet’s evaporation rate, which was not the case. During the “dark burning periods” when no flame was visible, the evaporation rates were essentially constant, similar to what is seen with a visible flame. Interestingly, these evaporation rates suddenly stopped when the afterglow of the scattered light began to appear. 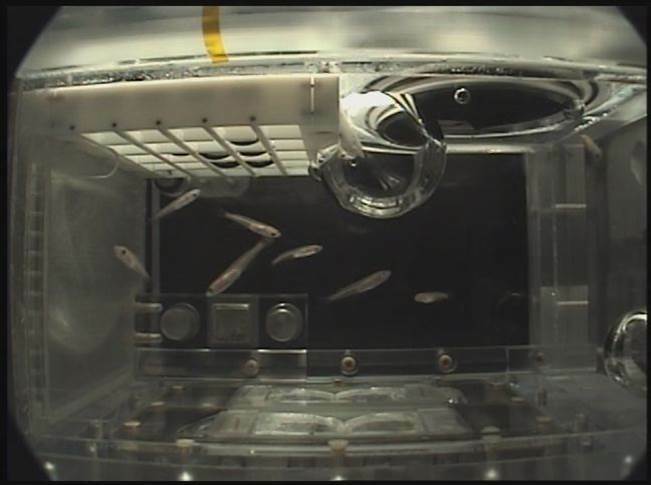 In 65 years of previous droplet experiments, and employing a staggering breadth of microgravity test configurations—from converted mine shafts in Japan to experiments performed on the recently retired space shuttles—this phenomena had never been observed. The prior universal observation was that when the flame went out, the rapid evaporation of the droplet stopped. However, with these tests we now had a fuel droplet that continued to be consumed at a rapid rate without an apparent flame. 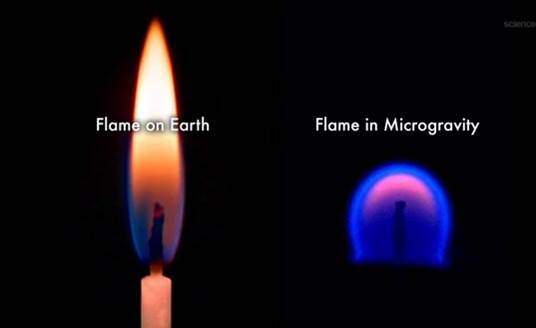 So what exactly is a cool flame and why is it important? The discovery of cool flames is often attributed to Sir Humphry Davy in 1812. While investigating flames for the purpose of designing safety lamps for coal miners, Davy observed that he could generate flames in the lab that were so weak that they could would not even ignite a match. This finding was followed by W.H. Perkins, who published in 1882 the first investigation of cool flames. Perkins observed that vapors of organic fuels produced what he characterized as “blue lambent flames.” Generally speaking, cool flames are the visible light of oxidation reactions occurring at low temperatures, sometimes nearly 10 times less than normal flame temperatures. Despite the name, these flames’ temperatures are still sufficiently high to sustain chemical reactions. Understanding exactly what kind of chemical reactions are taking place, as well as the conditions necessary to propel the chemistry into the high temperature realm of hot flames, are key research areas in the study of cool flames. Prior to the FLEX discovery, it was thought cool flames were primarily pre-ignition phenomena generally limited to pre-mixed gases. If you’ve ever taken your car in for engine knocking, you’ve experienced an example of this. 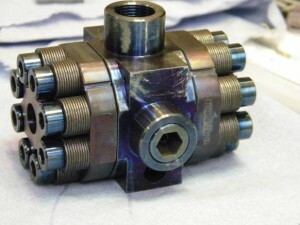 Pockets of gas in the cylinder undergo low temperature reactions (i.e., cool flames) that result in poorly timed pressure peaks. These deviations from the optimal peak pressure timing that should occur shortly after spark ignition result in the noise often associated with engine knock. 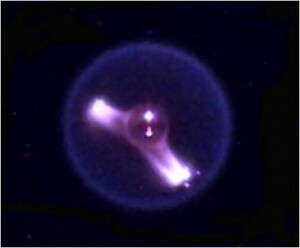 The FLEX study, however, showed a post-ignition cool flame. This occurred in a controlled system where reactants are initially separated, requiring time to travel to the reaction zone, which we see as the flame. This appears as a relatively steady phenomenon, suggesting a delicate balance between heat generated by the reaction and heat losses to the surrounding—to date, only achievable in space. The microgravity cool flame discovery is significant for a number of reasons. Low temperature combustion in internal combustion engines, for instance, offers a number of advantages: reduced emissions, less wear on engine parts and increased fuel efficiencies. A better understanding of these low temperature burning regimes may help address challenges facing new internal combustion technologies, such as the Homogenous Charge Compression Ignition (HCCI) and Reactivity Charge Compression Ignition (RCCI) engines. Since these technologies lack a spark for localized ignition, knowledge of cool flames may help with precise timing of the combustion event—based, in this case, on a reactant mixture that may only be partially pre-mixed. Microgravity cool flames are exciting in their own right, because of the potential for refining our understanding of a very complicated combustion phenomena. This is true of all serendipitous discoveries, giving one more example of how the space station provides an opportunity for discoveries that would otherwise never get made. Mike Hicks, project scientist at NASA’s Glenn Research Center in Cleveland, has been with NASA for 22 years and is currently probing the mysteries of droplet combustion as a co-investigator on the Flammability and Extinction (FLEX) study. He is also the principal investigator on the Supercritical Water Mixture (SCWM) International Space Station flight investigation, which is designed to study precipitation phenomena in near-critical water. Hicks spends much of his free time as a doctoral candidate at Case Western Reserve University putting the finishing touches on a dissertation he plans to complete in the fall of 2013. 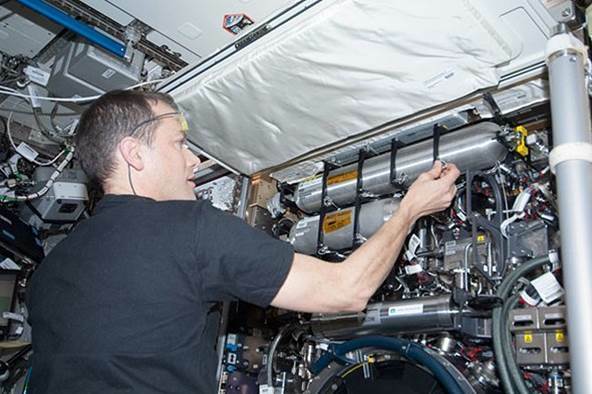 In today’s A Lab Aloft, guest blogger Fred Kohl, Ph.D., International Space Station Physical Sciences Research project manager at NASA’s Glenn Research Center in Cleveland, talks about some of the physical science investigations that take place in microgravity aboard the space station. Extremes are part of exploration, whether you’re talking about space travel or probing new areas of discovery to expand knowledge in a given science. 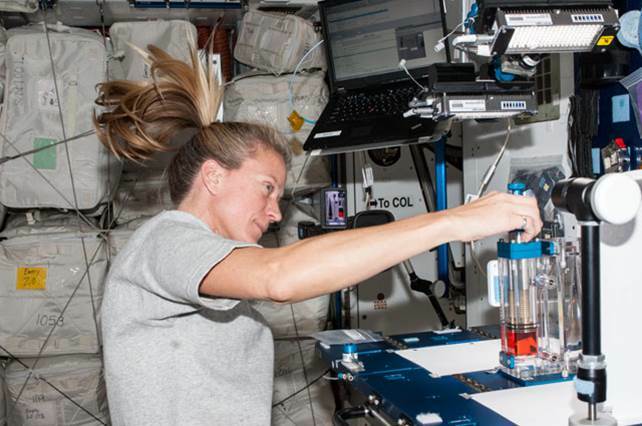 So it is appropriate that the extreme environment of the International Space Station provides an ideal location to study physical sciences, from flames to fluids. Removing gravity from the equation aboard this Earth-orbiting laboratory reveals the fundamental aspects of physics hidden by force-dependent phenomena where a fluid phase (i.e., a liquid or gas) is present. Such experiments, which investigate the disciplines of fluid physics, complex fluids, materials science, combustion science, biophysics and fundamental physics, use the station’s specialized experiment hardware to conduct studies that could not be performed on the ground. The main feature differentiating the space station laboratory from those on Earth is the microgravity acceleration environment that is stable for long periods of time. Conducted in the nearly weightless environment, experiments in these disciplines reveal how physical systems respond to the near absence of buoyancy-driven convection, sedimentation, or sagging. 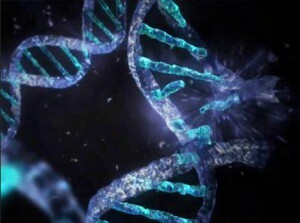 They also reveal how other forces, which are small compared to gravity, can dominate the system behavior in space. For example, capillary forces can enable the flow of fluids in relatively wide channels without the use of a pump. Other examples of observations in space include boiling in which bubbles do not rise, colloidal systems containing crystalline structures unlike any seen on Earth, and spherical flames burning around fuel droplets. Also observed was a uniform dispersion of tin particles in a liquid lead melt, instead of rising to the top as would happen in Earth’s gravity. These findings may improve the understanding of material properties, potentially revolutionizing development of new and improved products for use in everything from automotives to airplanes to spacecraft. 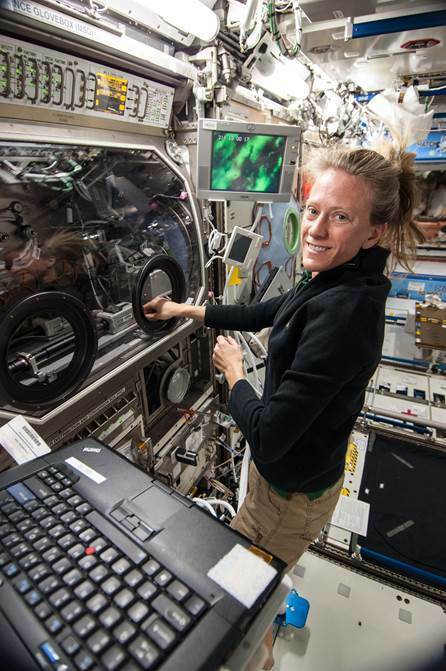 With so much to learn in the area of physical science and so many investigations, I would like to highlight several studies ongoing, upcoming or recently looked at aboard the space station. Studying mixed fluids in microgravity for CVB-2 provides data to further optimize the performance of wickless heat pipes. These pipes weigh less and have reduced complexity as compared to the more common construction with a wick. The CVB-2 study examines the overall stability, fluid flow characteristics, average heat transfer coefficient in the evaporator, and heat conductance of a constrained vapor bubble under microgravity conditions as a function of vapor volume and heat flow rate. 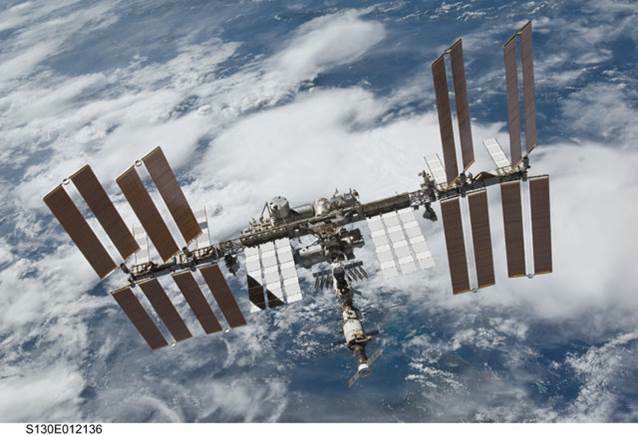 Findings from this research may lead to more efficient ways to cool electronics and equipment in space, while also applying to advances in Earth technologies such as air conditioning and refrigeration systems. Laptop computers also use this type of heat pipe technology to cool their electronics in order to prevent overheating. ACE studies colloidal particles in space for use in modeling atomic systems and engineering new systems. These particles are big enough—in comparison to atoms—to be seen and recorded with a camera for evaluation. 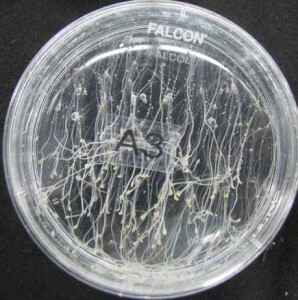 Conducting this study aboard the space station removes gravitational jamming and sedimentation so that it is possible to observe how order rises out of disorder, allowing researchers to learn to control this process. This could lead to greater stability and longer shelf life for products on Earth, such as paints, pharmaceuticals and other products based on colloids. Recently we launched additional hardware, consisting of a magnetic mixer and a drill kit, to use in mixing the samples for future ACE experiments. The CFE investigation is a suite of fluid physics flight experiments designed to study large-length scale capillary flows and phenomena in low gravity. Testing will probe dynamic effects associated with a moving contact boundary condition, capillary-driven flows in interior corner networks, and critical wetting phenomena in complex geometries. 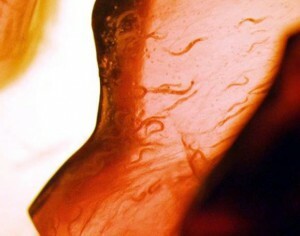 The sample fluids flow in specific directions influenced by the shape of unique cylindrical containers called Interior Corner Flow (ICF) vessels. 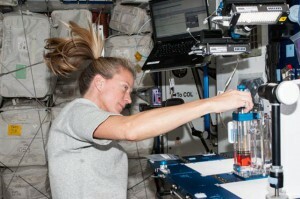 For CFE-2 there are 11 units of fluids for astronauts to test. This research and the resulting math models based on the data findings helps with the design of more efficient fuel systems for spacecraft. This is because the engineers will be able to design the shape of the tank to take advantage of the way fluids move in microgravity. On Earth these findings may contribute to models to predict fluid flow for things like ground water transport, as well as the afore mentioned cooling technology advances for electronics. The objective of this investigation is to observe and characterize evaporation and burning of renewable-type fuel droplets in high-pressure conditions. 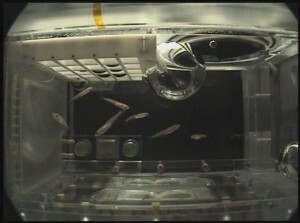 Test runs for this study recently took place in the Combustion Integrated Rack (CIR) aboard station. Research conducted in the CIR facility includes the study of combustion of liquid, gaseous and solid fuels. The CIR is made up of an optics bench, combustion chamber, fuel and oxidizer control, and five different cameras for performing combustion experiments in microgravity. Researchers can use the results of these experiments to develop and validate thermo-chemical and chemical kinetics computer models of renewable liquid fuels for combustion simulation in engines. 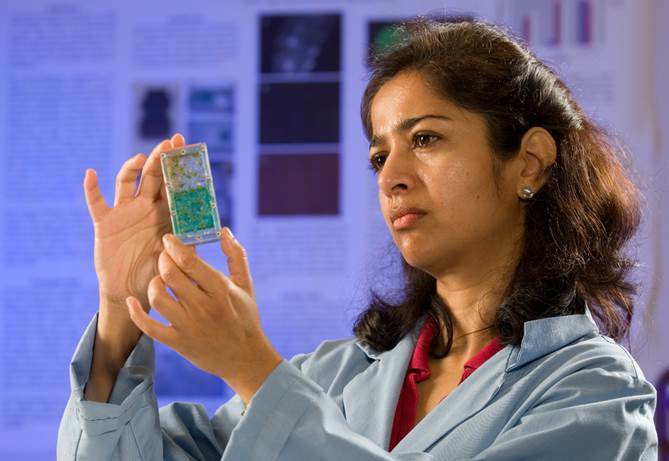 This helps with the design of the next generation of fuels and advanced engines. The computer models may reduce costs to industries and benefit the general public by accelerating the adoption of renewable fuels that are environmentally friendly. The SCWM investigation will help researchers look at phase change, solute precipitation, and precipitate transport at near-critical and supercritical conditions of a dilute salt/water mixture. When water is taken into its supercritical phase—a temperature higher than 705 degrees Fahrenheit and a pressure higher than 3,200 psia—it becomes highly compressible and begins to behave much like a dense gas. In its supercritical phase water will experience some rather dramatic changes in its physical properties, such as the sudden precipitation of inorganic salts that are normally highly soluble in water at ambient conditions. The primary science objectives of the SCWM investigation are to determine the shift in critical point of the liquid-gas phase transition in the presence of the salt, determine the onset and degree of salt precipitation in the supercritical phase as a function of temperature, and to identify the predominant transport processes of the precipitate in the presence of temperature and/or salinity gradients. On Earth water reclamation from high-salinity aquifers, waste handling for cities and farms, power plants, and numerous commercial processes may benefit from the SCWM findings. A good understanding about the behavior of salt in near-critical and supercritical conditions also would assist designers of the next generation of reactors. With the knowledge gleaned from SCWM, they could possibly design systems that would operate without incurring large maintenance problems. Fred Kohl is the International Space Station Physical Sciences Research project manager at Glenn. 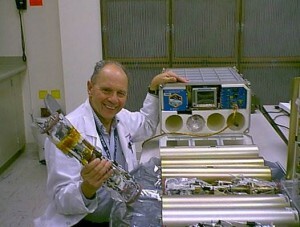 Since the mid-1980s, he’s been involved in the advocacy, definition, development and conduct of more than 250 experiments in ground-based facilities and aboard the space shuttles, Mir space station and the International Space Station in the disciplines of fluid physics, complex fluids, combustion science, fundamental physics, materials science and acceleration environment characterization. 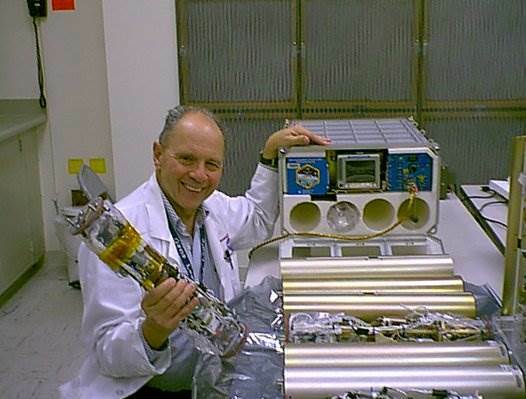 Before joining the microgravity program, he conducted research in high-temperature materials chemistry and high-temperature materials corrosion related to aircraft engine applications. He holds a B.S. 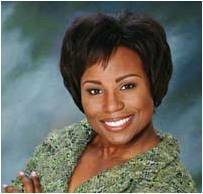 in chemistry from Case Institute of Technology and a Ph.D. in chemistry from Case Western Reserve University.